ALavandhAr explains kshEthragyathva (being jIvAthmA) of brahmA rudhra et al and parathva (supremacy) of bhagavAn through incidents from ithihAsam and purANam. prajA paSu pathI paripAthi – protected brahmA who is known as prajApathi and Siva who is known as paSupathi? Siva: (abhUth) – became pure? 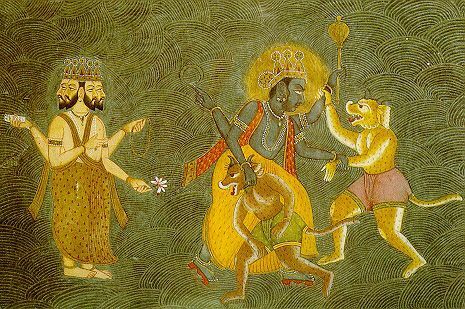 Who else (other than you) protected brahmA who is known as prajApathi and Siva who is known as paSupathi, by removing the dangers such as stealing of vEdham [brahmA losing vEdham], sin acquired due to plucking own father’s head [rudhra plucking the head of brahmA] and grief inflicted by asuras [for indhra et al dhEvathAs] etc? Beholding on his head, by whose SrIpAdha thIrtham (holy water which washed the feet), that Siva became pure? vEdhApahAra – Explaining how brahmA was given the divine vision into vEdham as said in SvEthASvathara upanishath 6.18 “yO vai vEdhAmScha” (one [bhagavAn] who instructed the vEdham to brahmA), such vEdham was stolen by asuras (demons), brahmA became drowned in an ocean of sorrow after losing vEdham, emperumAn helped brahmA by destroying the enemies, rescuing vEdham and giving it back to him. mahAbhAratham SAnthi parvam 357.31 “thathO hruthEshu vEdhEshu brahmANam kaSmalO’viSath | thathO vachanamISAnam prAha vEdhair vinAkrutha: || brahmA – vEdhA mE paramam chakshu: vEdhA mE paramam dhanam | vEdhA mE paramam dhAma vEdhA mE brahma chOththamam || mama vEdhA hruthAs sarvE dhAnavAbhyAm balAdhitha: | andhakArA imE jAthA lOkA vEdhair vivarjithA: || vEdhAdhruthE hi kim kuryAm lOkAn vai srashtumudhyatha: | ahO batha mahath dhu:kham vEdhanASanajam mama || prAptham dhunOthi hrudhayam mAm thu SOkAmayasthvayam || …. jagrAha vEdhAnakilAn rasAthalagathAn hari: | prAthAchcha brahmaNE rAjan | thathas svAm prakruthim yayau || thathasthayOr vadhEnAsu vEdhOpaharaNEna cha | SOkApanayanam chakrE brahmaNa: purushOththama: ||” (Subsequently, after the vEdhams were stolen brahmA lost his mind. He spoke to ISvara thus – vEdhams are my superior eyes; they are my superior wealth; they are my superior radiance; they are my supreme brahmam. By the strength of asuras, the vEdhams are stolen from here. The world is surrounded with darkness due to the loss of vEdhams. What will I who started creating the worlds, do? Alas! I am inflicted with this great sorrow due to the loss of vEdhams. This disease of sorrow is torturing my mind… hari retrieved the vEdhams from rasAthala (one of the lower regions) and gave it to brahmA. Oh king! brahmA regained his composure after that. In this manner, by killing the demons madhu and kaitabha and retrieving the vEdhams, purushOththama eradicated brahmA’s grief ) and so on. guru pAthaka – rudhra, out of arrogance cut the head of brahmA who is lOkaguru (universal teacher) and his own father and became a sinner. bhagavAn protected rudhra by eliminating his sins and gave life to brahmA whose head was cut-off. SrImathsya purANam 182 “dhEvIm prathi rudhra: – thatha: krOdhaparIthEna sarakthanayanEna cha | vAmAngushtanakAgrENa chinnam thasya SirO mayA || brahmA – yasmAdhanaparAdhasya SiraS chinnam thvayA mama | thasmAchchApasamAvishta: kapAlIthvam bhavishyasi || rudhra: – brahmahA”kulithO bhUthvA charan thIrthAni bhUthalE | thathO’ham gathavAn dhEvi himavantham SilOchchayam || thathra nArAyaNaS SrImAn mayA bhikshAm prayAchitha: | thathasthEna svakam pArSvam nakAgrENa vidhAritham || mahathi sravathI dhArA thasya rakthasya nissruthA || vishNu prasAdhAth suSrONi | kapAlam thath sahasradhA | sputitham bahudhA yAtham svapnalabdham dhanam yathA ||” (rudhra told dhEvi (pArvathi) – Subsequently, by me who was angry with reddish eyes, that brahmA’s head was plucked with my left thumb’s nail. brahmA – Since you cut off my faultless head, you shall be cursed and will be a kapAli (one who has my skull stuck to your hand). rudhra – Oh dhEvi! I went around many holy places being afflicted with brahmahaththi dhOsham (killing of a brAhmaNa) and worried and finally reached the himAchala mountain. I begged for alms from SrIman nArAyaNan there. He then scrapped a part of his body with his nail. Blood started flowing from there…. Oh beautiful lady! by the grace of vishNu, that kapAlam (skull) broke into thousands of pieces and disappeared like wealth acquired in dream [wealth acquired in dream disappears once woken up from sleep]) and so on. dhaithya pIdAdhi Apath vimOchana – hiraNya, rAvaNa et al; asuras from thripura (three towns); Adhi indicates curse of dhurvAsa rishi etc. Removing the dangers of dhEvathAs from these situations. mahishta pala pradhAnai: – [Not only he rescued them from dangers] Though they are jIvAthmAs, emperumAn bestowed them great honours such as [rudhra] to be famously known as “ISvara” all over the world [and brahmA to be considered as creator and so on]. [pramANams (authentic texts) quoted to establish that these dhEvathAs are also jIvAthmAs who are bound in this material world] mahAbhAratham sabhA parvam 14.8 “yuga kOti sahasrANi vishNumArAdhya padhmabhU: | punasthrailOkyadhAthruthvam prApthavAnithi SuSruma ||” (We hear that brahmA who is born in a lotus flower worships vishNu for 1000 crore yugams and again attains the position of being the lord of 3 worlds [upper, middle and lower layers]”, narasimha purANam “brahmAdhayas surAs sarvE vishNumArAdhya thE purA | svam svam padhamanuprApthA: kESavasya prasAdhatha: ||” (brahmA and other dhEvathAs previously worshipped vishNu and retained their positions by the grace of kESava), mahAbhAratham sabhA parvam “EvamEshO’surANAm cha surANAnchApi sarvaSA: | bhayAbhayankara: krishNas sarvalOkESvara: prabhu: ||” (In this manner, our lord and the lord of all the worlds, krishNa, always gives asuras (demons) and dhEvas (celestial beings) fear and protection respectively at all times). kOnya … – Who fully protects prajApathi and paSupathi from the dangers caused by themselves and others to them? kasya pAdha udhakEna … – The holy water from whose divine feet is held by rudhra in his matted hair, to make him Siva – Sudhdha (pure)? Who else is as pure as you to purify him when he brings upon impurity in him? ISvara samhithA – brahmA’s words – “dhravibhUthas thadhA dharmO haribhakthyA mahAmunE | gruhIthvA dharma pAnIyam padham nAthasya dhushtayE || kshALitham parayA bhakthyA pAdhyArgyAdhibhirarchitham | thadhambu pathitham dhrushtvA dhadhAra SirasA hara: || pAvanArtham jatAmadhyE yOgyO’smIthyavadhAraNAth | varshAythAnyatha bahUn ka mumOcha thadhA hara: ||” (Oh best among rishis! (When bhagavAn measured the worlds) at that time, dharmam (the deity for righteousness) out of devotion towards hari, assumed the form of water. I took that dharmam in the form of water and washed the divine feet of jagannAtha with great devotion. I also offered arghyam (washing the hand), pAdhyam (washing the feet) etc in worship. Looking at the [holy] water falling down, Siva firmly believing “I am qualified to accept this holy water [to purify myself]”, accepted the falling water in his matted hair on his head to purify himself. After that, he retained the water in there for thousands of years, without letting it go), periyAzhwAr thirumozhi 4.7.3 “… chathumukan kaiyil chadhuppuyan thALil chankaran sadaiyil thangi …” (gangA stayed in the hands of four-headed brahmA, and at the feet of four-handed vishNu and at the head of Sankara), periyAzhwAr thirumozhi 4.7.2 “nalam thigazh sadaiyAn mudik konRai malarum nAraNan pAdhath thuzhAyum kalandhizhi punal” ([gangA] water which flows down with the konRai flower from rudhra who has good qualities and the thuLasi from the divine feet of SrIman nArAyaNan) and so on. This entry was posted in Other, sthOthra rathnam on December 26, 2016 by Sarathy Thothathri.